The FIFA rankings are terrible. Behind the disguise of weighting factors and other funny math, the FIFA rankings are a table of results. Win a match, get 3 points. Draw a match, earn 1 point. Attempt to adjust for strength of competition and divide by the number of games played, and you have a rating for each country. But tables are misleading. For example, Newcastle finished 5th in the English Premier League. However, they scored only 5 more goals than they allowed, only 8th best among 20 teams. Goal differential is predictive of team strength, so Newcastle got a bit lucky this year. At least in the Premier league, each team plays every other team twice. Tables are even more misleading in world football since countries play schedules of differing strength. Here at The Power Rank, we have developed better ranking system based on years of research in statistical physics. Instead of counting up points for wins and ties, we solve a set of linear equations, the bedrock operation in modern data mining. Moreover, our algorithm accounts for margin of victory and strength of schedule in ranking countries. Using all major international competitions since 2009, our algorithm assigns each team a rating, which gives a team’s strength in goals compared to the average international team. So Spain’s 2.0 rating says they will beat the average team (Belgium) by 2 goals on average at a neutral site. While we haven’t tested these predictions on international football yet, the predictions for American college football work quite well. Over the last 10 years of college football bowl games (late season games played at neutral sites), the rankings have predicted more game winners, 62.4%, than the Vegas betting line, 61.7%. This sample includes 314 games. 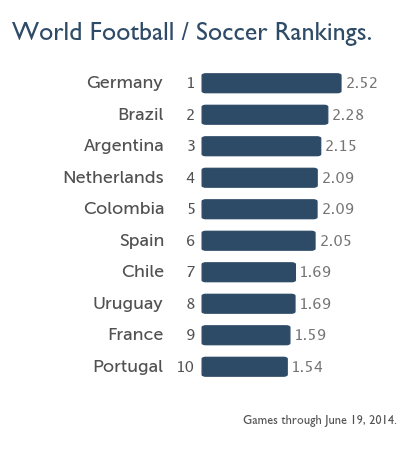 For world soccer, the rankings reveal some hidden truths that everyone ought to know. They haven’t done so well in their last two major competitions. The Brazilians exited the World Cup in 2010 in the quarterfinals against the Netherlands. Coach Dunga left after this debacle. Then in last year’s Copa America, Brazil lost to Paraguay in the quarterfinals. However, our algorithm still thinks highly of Brazil due to their consistent track record of success. They won the Confederation’s Cup in 2009. More importantly, they finished first in World Cup qualifying out of South America, a brutal stretch of 18 games against some of the best teams in the world. 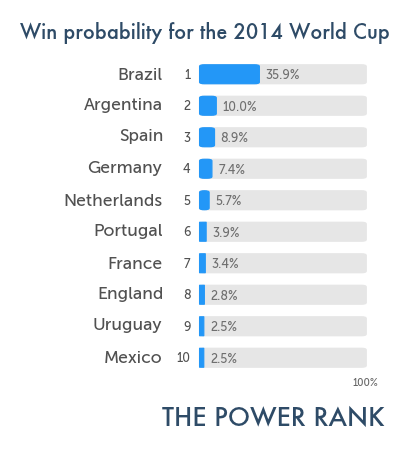 Lastly, tournament soccer leaves even the best teams in the world subject to random chance. Brazil lost to the Netherlands on a freak own goal by Felipe Melo. Their exit in Copa America came in penalty kicks after a 0-0 draw. Let’s contrast Brazil with Uruguay, the 5th best team in the world. Uruguay had more success than Brazil in the World Cup (4th place) and Copa America (winner). However, they finished 5th in World Cup qualifying in South America, 10 points back of Brazil. Uruguay had to win a playoff against Costa Rica just to make the World Cup. And then no one will ever forgot the luck bestowed upon Uruguay against Ghana in the World Cup. Tied late in the quarterfinal game, Uruguayian striker Luis Suarez intentionally blocks a sure goal with his hand. Then Ghana’s Asamoah Gyan missed the ensuing penalty kick, allowing Uruguay to win the game in penalty kicks. Watch it again here. We mean no disrespect to Uruguay. It takes incredible talent and work to earn the 5th spot in these rankings. However, Brazil is the better team. Is the United States better than Mexico? Well, no. 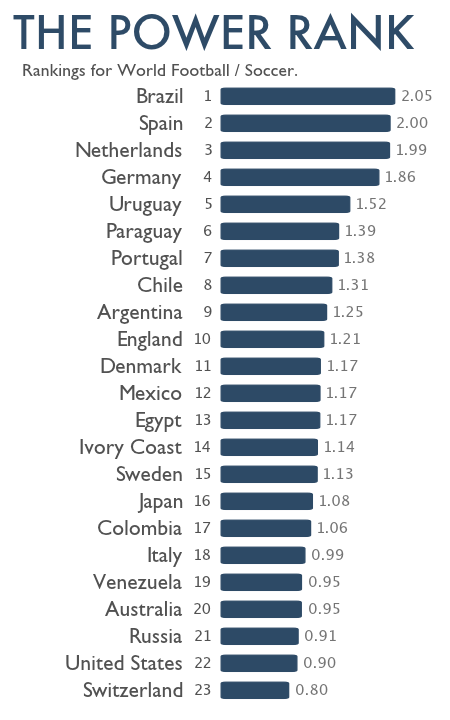 The Power Rank puts Mexico at 12th, while the United States comes in at 22nd. However, this distinction rests on a single game. In 2009, the United States went to the Confederations Cup in South Africa. That summer also featured the Gold Cup, the North American championship held every two years. While the Americans sent their first team to South Africa, they played a reserve unit on home soil in the Gold Cup. The reserves played very well, making it all the way to the final against Mexico. Even through halftime, the championship remained tied at 0. Then the wheels came off for the Americans. Mexico, who played first teamers like Gio Dos Santos and Gerardo Terrado, scored 5 goals in the second half. The U.S. line up featured Jay Heaps and Brian Ching, players who would not make the 2010 World Cup squad. If we do not include games from the 2009 Gold Cup, the United States and Mexico are ranked 18th and 19th respectively. Clearly, better rankings would account for situations in which one team doesn’t play their first team. For now, we’re treating all international matches the same. Who is the best team in Europe? Spain and the Netherlands are 2nd and 3rd in the rankings, separated by less than a hundredth of a goal. Essentially, our algorithm does not make a distinction between these two teams. The finals of Euro 2012 could quite possibly be a rematch of the World Cup final two years ago. Next week, we’ll reveal the full rankings and discuss how to use our algorithm to project the entire bracket for Euro 2012. If you’re interested in this, please follow The Power Rank on Twitter. We would love to hear from you. Are there other games like the 2009 Gold Cup final in which one team didn’t play their first team? How necessary is it to include friendly matches in these rankings? Please leave us a comment.